Photographing stars is tricky, to say the least. You need long exposures to capture their faint light, but they are permanently in motion, so you also need a tripod mount that rotates in sync with the Earth’s spin. Nick Risingerset out with his retired father, on a journey in which they covered 45,000 miles by air and 15,000 by land, from the desert of Nevada to the Northern Cape of South Africa, with the goal of photographing the entire night sky. 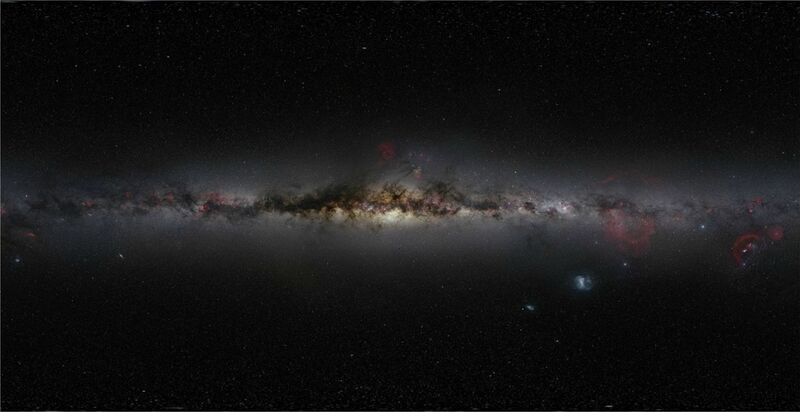 The project, called the Photopic Sky Survey is a 5,000 megapixel photograph stitched together from 37,440 exposures. The process of stitching alone took many months of work. Each piece of this puzzle is just 12 degrees wide. An interactive 360º is available to see on Risingerset’s website. Six air-cooled Finger Lakes ML-8300 monochrome cameras were used, each fitted with their own lenses and filters. The image is spectacular, not only because of the technical complexity involved, including very specialized software, but also because a lot of the starlight that we see in this photograph comes from stars that probably don’t exist anymore. This is in a way a photograph of the past. Stephen Hawking has said that he does not believe that time travel to the past is possible. If it were, we would now have people from the future around us, and there aren’t, as far as we know. Although it did seem we did for a while, with Steve Jobs. I’ve often imagined, however, that we eventually find a way to travel to the past, and instead of looking at photographs of our grandparents on an iPad, we would be able to see them in our dreams. It would be safe travel too, because since we are dreaming, there is no way to accidentally interact or interfere in any way with that world, something that would be disastrous, because that would modify the future. Hawkings does believe that time travel into the future is possible. Today we know that time goes by at different speeds, like the different parts of a river. As inconceivable as this may sound, matter drags on time and slows it down, so the closer to the Earth, the slower. 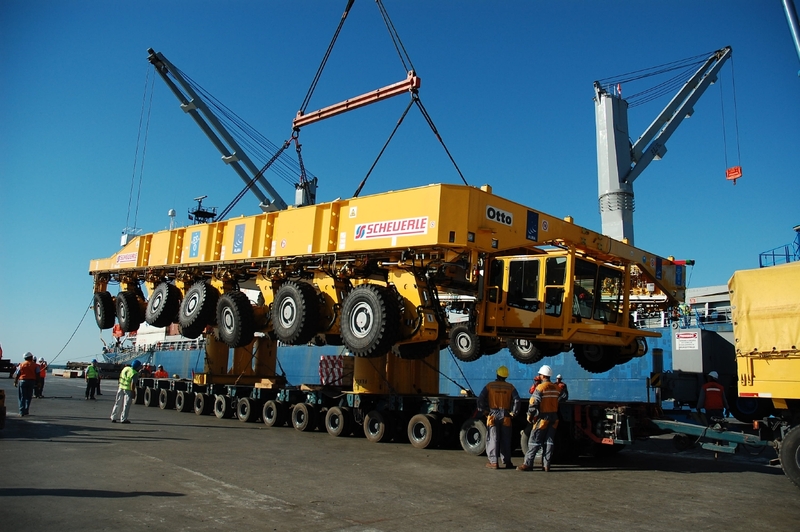 Also, the heavier the object, the more it drags on time. 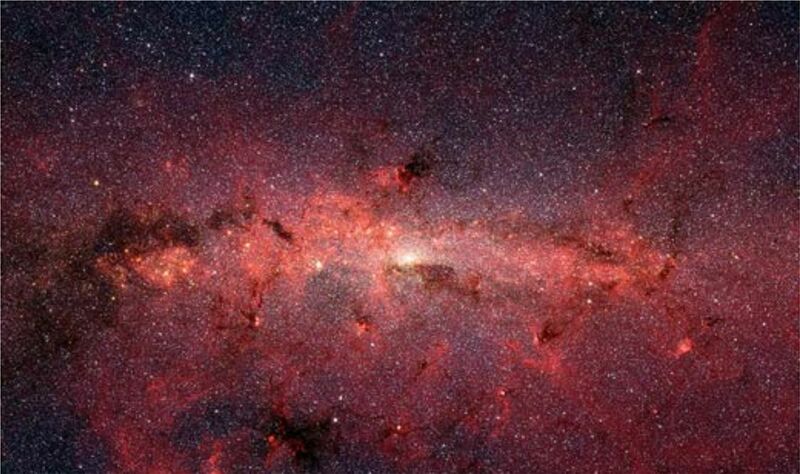 Sagittarius A, the black hole in the center of the Milky Way, has such gravitational pull that nothing, not even light, can escape it. A black hole like this has a dramatic effect on time, slowing it down like nothing else could. That time runs faster in space than on Earth has been demonstrated beyond any doubt. Satellites circling the Earth have very precise clocks on board, and these clocks gain about a billionth of a second every day. The system is designed in such a way that it corrects the drift, so it doesn’t upset the whole system. If they didn’t do this, it would cause every GPS device on Earth to go out by about six miles a day. In fact, this is the first practical engineering application of Einstein’s Theory of Relativity. 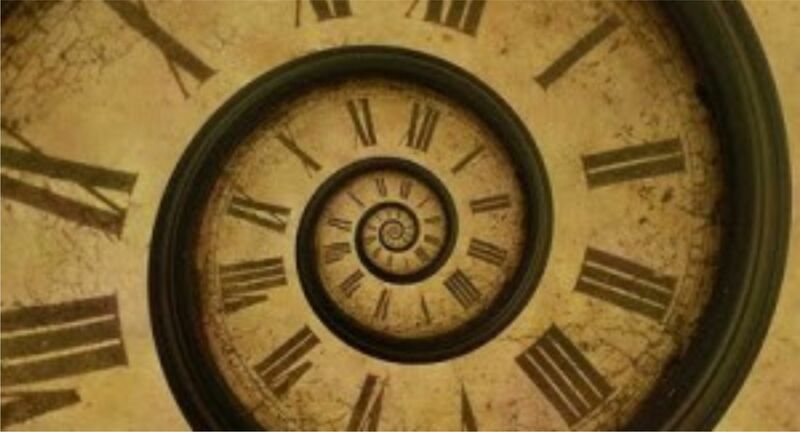 Many movies have used the theme of time travel or travel to different dimensions. Time is, in fact, just one of the many dimensions we have invented to explain and understand the world that surrounds us. In Terry Gilliam‘s provocative film 12 Monkeys, Bruce Willis plays a criminal who is transported back in time from a post-apocalyptic future in an attempt to prevent the outbreak of a virus that kills most of the world’s population. In Inception, Leonardo DiCaprio‘s character, Dom Cobb, is a thief specialized in the art of extraction of valuable secrets from deep inside the subconscious, when the mind is most vulnerable. In Source Code, Colter Stevens, a US Army helicopter pilot, is sent to the past and he is put in another person’s consciousness to try to stop a terrorist attack. Fiction, as we know very well, is usually inspired in reality. But fiction can in turn inspire us too. The US Army has this year awarded almost half a million dollars to a company, to help in the development of an experiment to help its soldiers cope with PTSD (post traumatic stress disorder) after returning from conflict. US soldiers go to war not only to “fight for freedom”. They also become experiments. Up to 52% of combat veterans with PTSD report having nightmares often. This is because when we are sound asleep we cannot control our memory and the dream world can become a frightening experience, completely out of our control. The experiment brief explains the objective: Research and development to augment the current Cognitive Behavioral Treatment (CBT) approaches for warrior trainees (WT) and other patients suffering with nightmares related to post traumatic stress disorder (PTSD)/traumatic brain injury (TBI) with technological advances in biofeedback and Virtual Reality (VR). Using a computer program, soldiers would build imaginary worlds and avatars which would be based on the virtual world Second Life. These would become dream sequences designed to counteract the traumatic memories, neurologically distract the soldier and stimulate relaxation. The soldier would have to learn how to activate these scenarios using 3D goggles, which he would put on after waking up from a nightmare. The dream could involve the soldier being surrounded by people he trusts and loves, and they would help him get through this hard moment. Because it is so difficult to call up images that calm you down when you are in distress, the soldiers would help design these images and they would just have to play them back. ALMA is the biggest array of telescopes in the world and the largest astronomical project ever attempted, a truly global partnership between scientists from Japan, Europe, Canada, the US and Chile. It is located deep in the Atacama desert of Chile, in an inhospitable region called Chajnantor Plateau. Because of its altitude, dry air (this is the driest place on Earth), nearly non-existent cloud cover (320 clear skies per year), and lack of both light pollution and radio interference, it is probably the best location in the world to conduct astronomical observations. It is largely transparent to the millimeter and submillimeter wavelength range that ALMA is designed to detect. Most of the photons in the Universe are in this wavelength, that lies between what is traditionally considered microwaves and infrared waves. Star formation occurs in dense molecular clouds observable only in the submillimeter range, and most of this radiation is absorbed by atmospheric water vapor. This is why such a dry location is so important. The rarified atmosphere at this altitude is very demanding for humans, this is why the telescopes are assembled from parts arriving from different parts of the world at a camp at 3000m and then transported to their final position. The final configuration should consist of around 60 antennas. 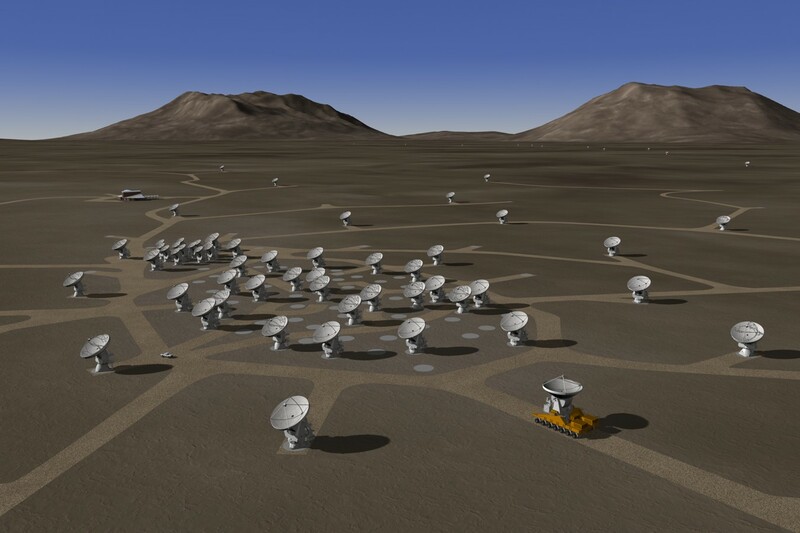 ALMA is by no means alone in the Atacama desert. 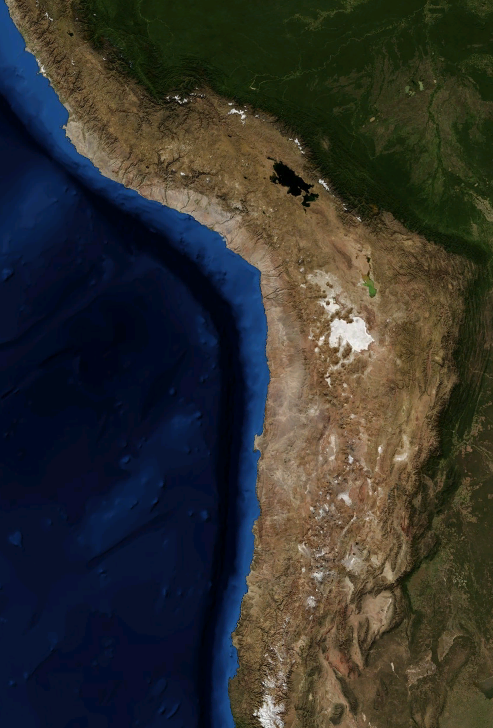 The European Southern Observatory operates two major observatories in the Atacama: the La Silla Observatory and the Paranal Observatory, which includes the Very Large Telescope. 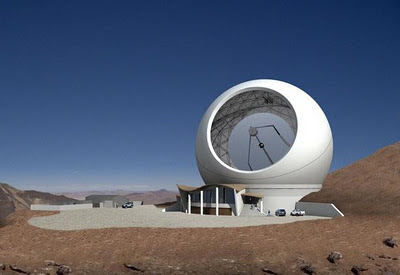 Another impressive piece of equipment, the CCAT, Cornell Caltech Atacama Telescope, currently under construction by an international consortium, will also be located in the area, near the summit of Cerro Chajnantor, about 600 m above and only 5 km from ALMA. ALMA will give astronomers an unprecedented window on the cosmos, enabling groundbreaking studies into areas such as the physics of the cold Universe, the first stars and galaxies, and even directly imaging the formation of planets. This video shows the ALMA facilities. This second HD time-lapse video was shot around ALMA to celebrate its first observations. It’s 5 marvelous minutes of an strange pleasure…the realization that we live in a rock that spins at 1000km per hour, a tiny speck of dust inside a cloud that travels at 250km per second across the inmensity of the Universe.